Today is all about spreading the love! I know valentines day is tomorrow, but I have a few lovely things to share with you today. First up, my soothing low volume charm squares from the Low Volume Charm swap hosted by the lolly-liscious Laura Jane! 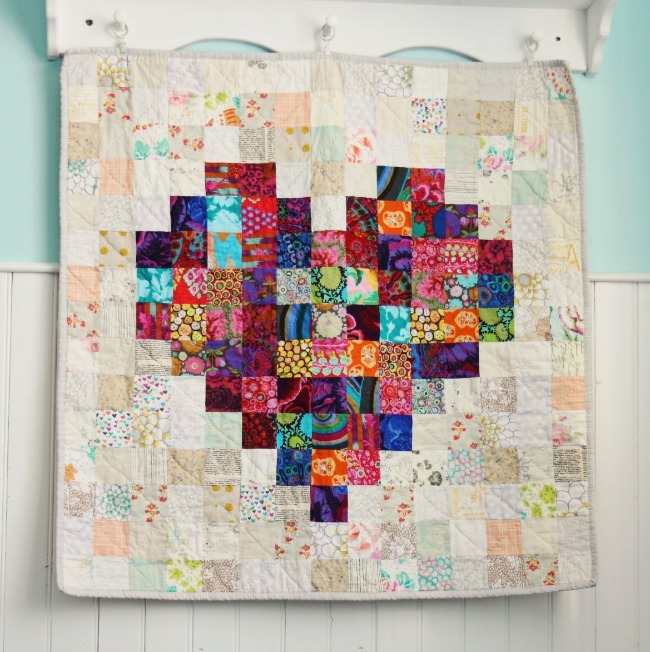 I’m thinking LV charm squares for the background, and vintage brights for the heart! Yum! Next up, I’m sharing the love of some very happy & proud faces from my latest ‘Machine Sewing for Beginners’ course. Not only did they conquer the sewing machine, tension problems, different feet, rotary cutters & seams, but they put zippers into their first cushions, and also made quilted tote bags! Well done ladies! You were amazing! And on the theme of classes, I have just released my new programme for next term (April – July) which you can see here. Just drop me an email if you would like to sign up for a class or workshop. And last but not least, I’ll be spreading more love tomorrow with a very special Valentine’s day giveaway! Oooh, it’s a guddun’! Previous Previous post: Who Lives in a House Like This? Next Next post: Valentine's Day Giveaway!